There are considerable national and regional differences between – and within – the three countries that make up the Baltic States; but they share a continuity of culture. All have folk song-poetry of the runo-song type and ll three countries saw the creation of Soviet-supervised folklore troupes and separate folklore revivals. Now, some composers are creating traditional musical forms and textures that connect with the present day. The Latvian composer Eriks Esenvalds is a most sought-after choral composers working today, with a busy commission schedule and performances of his music heard on every continent. Acclaimed Finnish composer creates a fascinating piece based on the Inuit Legend of The First Tear about a seal hunter who was so upset about his failure to catch a seal that he shed the very first tear. 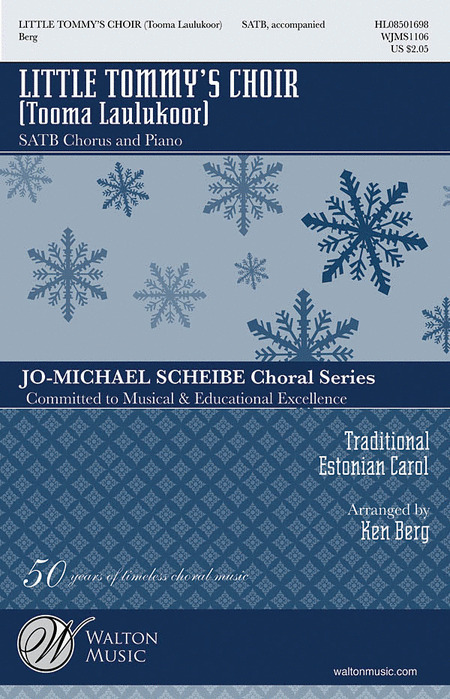 Fun settings of a traditional Estonian carols, these secular winter-themed songs reflects on the joys of winter and skating in a gentle waltz feel. Brisk and energetic songs with simple melody, limited ranges and shared rhythmic patters make them enjoyable for high school mixed choirs.. 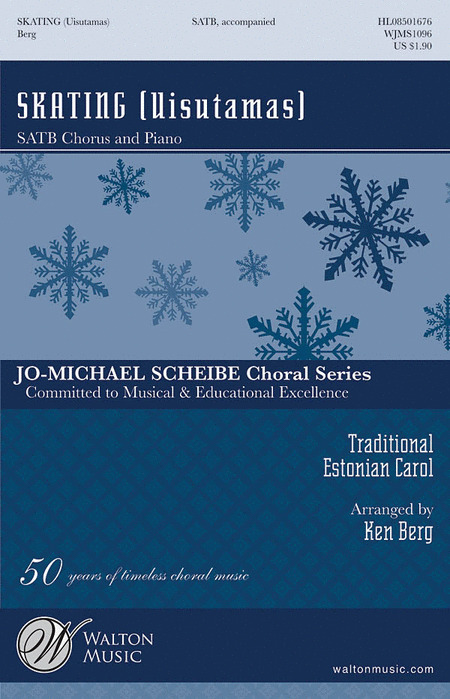 In Estonian, with a pronunciation guide and a singing English translation, this suits both beginning and more advanced mixed choirs, with quick and easy preparation for both choir and accompanist. Both Estonian and English text. The second volume of the successful Let the Peoples Sing series, this volume brings original sacred music by Baltic-region composers to your church choir. Every piece is designed for use in worship, covering a variety of styles, forces, and difficulty levels. Helpful notes and guides are included. Vasks compositions incorporate archaic, folklore elements from Latvian music and place them within a dynamic and challenging relationship with the language of contemporary music. The works are frequently given programmatic titles based on natural processes. Vasks' intentions are however not so much a purely poetic praise of nature or showy tone painting, but rather the pursuit of themes such as the complex interaction between man and nature and the beauty of life on the one hand but also the imminent ecological and moral destruction of the world which he expresses in musical language. A striking setting of the Mass by Latvian composer which has been recorded by the Choir of Trinity College, Cambridge. 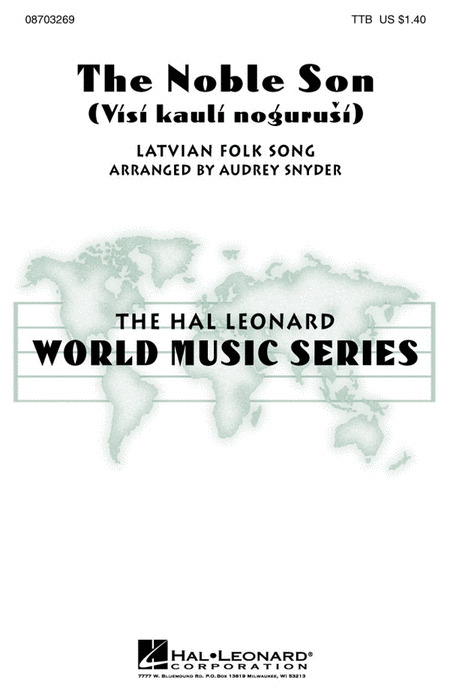 With captivating settings of Latvian choral music featuring folk songs and poetry by composers Rihards Dubra, Eriks Esenvalds, and Vytautas Miskinis, as well as thrilling arrangements of ancient pagan folksongs by Ilona Rupaine and Juris Vaivods, this exciting anthology of Christmas music from Latvia and Lithuania is perfect for choirs looking to broaden their musical horizons during the festive period. Baltic choral music has undergone a massive resurgence in recent years. Sacred choral music, in particular, has flourished since the end of the Soviet era, with composers such as Eriks Esenvalds and Rihards Dubra achieving international recognition. 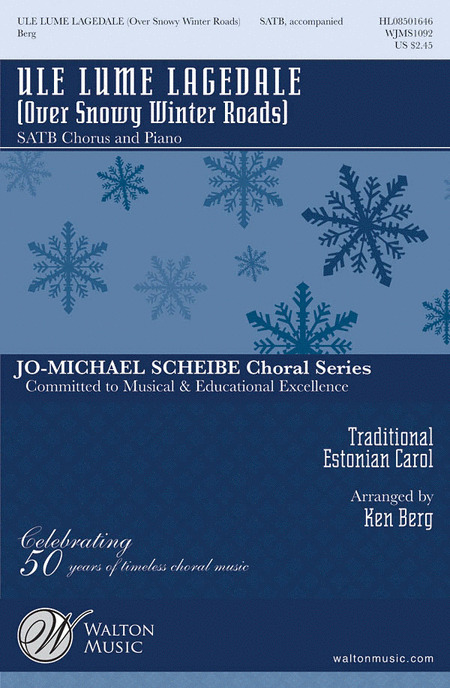 This collection of choral music brings together a number of works by Esenvalds and Dubra, and a varied selection of Christmas music, some to standard Latin texts, some to Latvian poetry, others drawing both words and melody from the older pagan tradition of masked singers and dancers. As Latvia's centenary drew near, the artistic director and head conductor of State Choir Latvia - M ris Sirmais - revealed an idea for a gift to Latvia: to make a creative laboratory in which Latvian composers would create new a capella pieces for mixed choir. As a result, inspired by the idea 77 composers wrote songs for mixed choir. State Choir Latvia collected, rehearsed and performed the works over the course of three years and five concerts. This new repertoire would be relevant not only during Latvia's celebrated anniversary, but also for many years after the grand festivities. Latvian and English text. Contents: Röntyshkä (Dance Song) I - Röntyshkä II - Röntyshkä III - Röntyshkä IV - Röntyshkä V - Chastushka (Jocular Song) I - Chastushka II - Roundelay - Ending and Going Home. 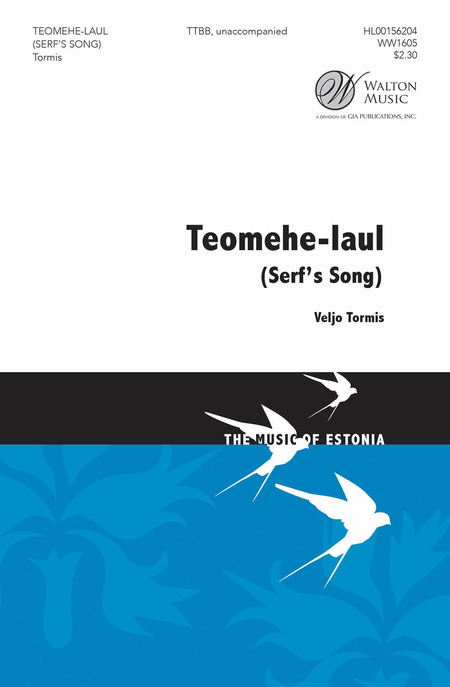 Veljo Tormis is an Estonian composer, regarded to be one of the greatest living choral composers and one of the most important composers of the 20th century in Estonia. Internationally, his fame arises chiefly from his extensive body of choral music, which exceeds 500 individual choral songs, most of it a cappella. 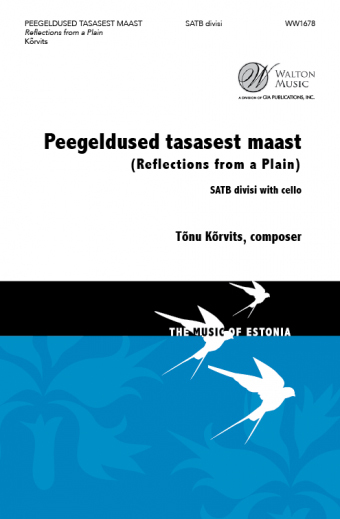 The great majority of these pieces are based on traditional ancient Estonian folksongs (regilaulud), either textually, melodically, or merely stylistically. This work for men's voice is challenging yet very worthwhile. Veljo Tormis is recognized especially for his vocal and choral works. For him, music begins with words; he does not have "purely musical" ideas. Tormis is a real master of large-scale choral composition. His music is often connected with ancient folk songs of Estonian and other Balto-Finnic peoples. For female voices. 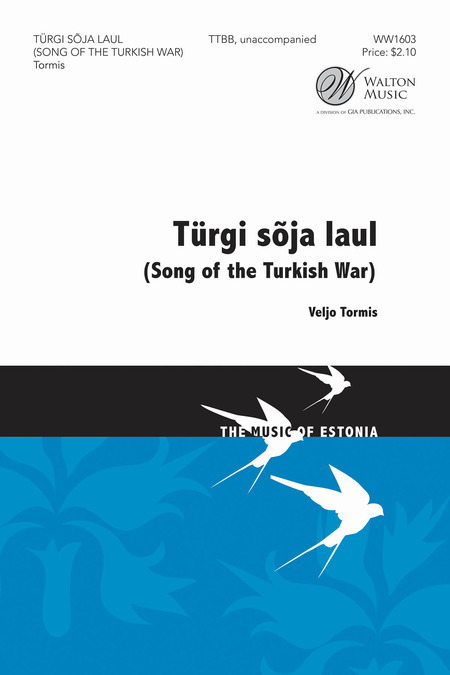 During the Soviet occupation the Estonian composer Veljo Tormis composed several dark-toned songs to texts by leading Estonian poets. Vision of Estonia is based on lyrics by Juhan Liiv. In it Tormis poured out his feelings of a creative person trapped within the Soviet regime. Veljo Tormis (b. 1930) is recognized especially for his vocal and choral works. For him, music begins with words; he does not have "purely musical" ideas. Tormis is a real master of large-scale choral composition. His music is often connected with ancient folk songs of Estonian and other Balto-Finnic peoples. The Story of the Bishop and the Pagan, drawn from musical documents and folklore, tells of the death of the British warrior and Christian missionary Bishop Henry at the hands of the Finnish peasant farmer Lalli near the town of Turku (Abo) in the winter of 1158. By a fortunate and unusual historical circumstance, the viewpoints of both sides have been preserved: a written Latin Gregorian chant "The Sequence Of Saint Henry" documents the British Christian side, and numerous folk songs represent the event as seen by the Finnish pagan. A fascinating and rewarding work for unaccompanied male voices. Beneath the apparent simplicity and charm lies a richness and complexity that rewards. Tormis' choral works marry traditional Estonian folk melodies with contemporary but accessible harmonies. The texts for this composition have been compiled from runic songs about the sea, using source material from Haljala, Kuusalu, Ridala and Muhu in Estonia. The written transcriptions of the texts, translated from the vernacular, were made in 1973-74. The Lithuanian composer has created a beautiful contemporary motet featuring chant-like melodies, a dramatic climax, and a hushed ending. A movement of a larger suite, Under the Baltic Sun, this Latvian folk song is the lament of an oppressed people. For mixed chorus and piano, the publication includes text translation and IPA pronunciation guide. Orchestra score and parts available on rental from the publisher. Duration: ca. 3:00. Orchestra score and parts available on rental from Boosey & Hawkes. A Latvian folk song from long ago, but poignant for our time. The poem speaks of a soldier who has returned from war to find his young sister grown. Intelligent vocal part writing that is rich and sophisticated in men's voices. One of a set of five folk songs that may be performed together or individually. Following the popular Estonian carols Ule Lume Lagedale and Skating, this Christmas song celebrates the season's joy with children and animals. It is fun and quick to prepare for high school and beyond. In easy Estonian with pronunciation guide, or English. Part Uusberg's beautiful asthetic shines once again in his work Mis on inimene?. Lush harmonies build to a rich soundscape as the Estonian poem explores what it means to be human. Meaningful in today's climate: Take care, then you are cared for. 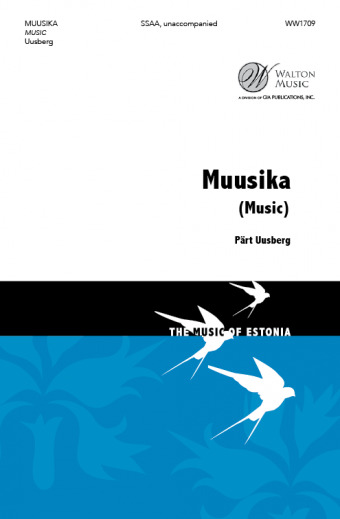 Music of Estonia Choral Series. An incredible Estonian poem about the mystery and wonder of music. A dynamic build of sound and tone helps to express the importance of the text. Gorgeous harmonies and solid construction. Don't miss this work that will resonate deeply with your singers. 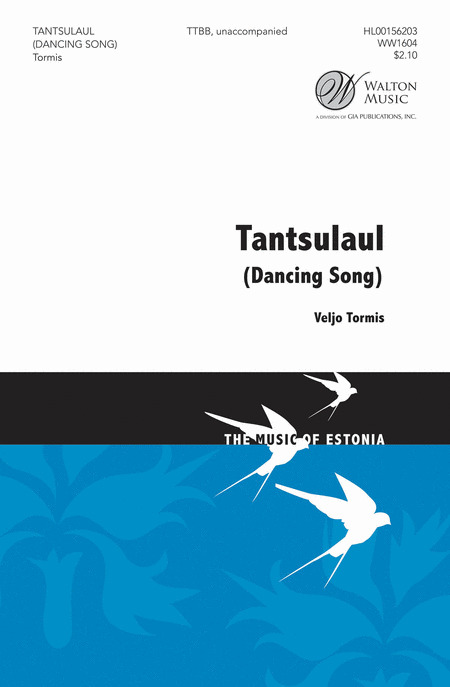 Music of Estonia Choral Series. 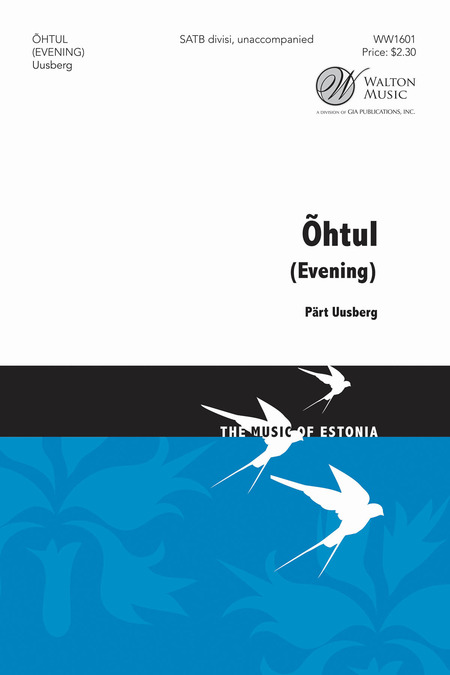 An incredibly beautiful work by well-loved Estonian composer Pert Uusberg. The poem speaks of evening and of the images we associate with dusk. Tonalities that are both familiar and otherworldly. This will be a favorite of your singers. This evocative work by one of Estonia's most celebrated contemporary composers carries the listener on a journey through the landscape of a plain. Using a rich and refined spectrum of harmony and colors, this work is truly unique. Also available for choir and cello. Music of Estonia Choral Series. This evocative work by one of Estonia's most celebrated contemporary composers carries the listener on a journey through the landscape of a plain. Using a rich and refined spectrum of harmony and colors, this work is truly unique. Also available for choir and flugelhorn. Music of Estonia Choral Series. From the collection, Men's Songs, this stunning melody is simply and beautifully set. The sad poem speaks of a poor man who longs to lay his burdens down and make haste for the Creator's realm. A good contrast to other, more humorous works in the set. From the collection, Men's Songs, this original uses a comic blend of Estonian and Russian to paint the picture of a soldier telling of his larger-than-life experience in war. Uses whistling and shouting to enhance the image. A beautifully sorrowful Latvian folk song arranged by Imant Raminsh. As the sun sets, the speaker remembers his dearest mother who has gone beyond and asks the sun to take to her sweetest evening peace. Absolutely delightful and masterful vocal writing and counterpoint. One of a set of five folk songs that may be performed together or individually. A sweet Latvian folk song featuring the story of two brothers falling in love with two sisters, while the third sister is yet too young to marry. Absolutely delightful and masterful vocal writing and counterpoint. One of a set of five folk songs that may be performed together or individually. From the suite Three Baltic Carols, this brisk and energetic song expresses joy about winter and the Christmas season. A secular carol, it would work well in holiday or winter concerts. The simple melody, limited ranges and shared rhythmic patters make this enjoyable for high school mixed choirs. Can be sung in English or Estonian, using the pronunciation guide provided. A demanding piano part rounds out an excellent concert opener, finale, or encore piece.